Part of the Gilmore Girls mythos is that the show’s creator Amy Sherman-Palladino has the last four words rattling around in her head. Words that she would have written, had the studio kept her for the final series or asked her to write the final episode. Quote from a terrific interview at Vulture. Since that quote, we’ve had the Veronica Mars kickstarter and the subsequent outpouring of Gilmore love in response. We’re also going through this weird Bunheads hiatus and I can’t see ASP twiddling her thumbs waiting for inspiration. Somewhere out there, I’m thinking ideas are knitting together. JK Rowling wrote the final chapter of the seventh Harry Potter book long before the first was even typed up. Gah, it’s such a tease! I can’t help thinking that if you know the destination, you’ve got some idea about the journey. Lorelai: Luke will you marry me? Rory: I hate you for ruining this for me! 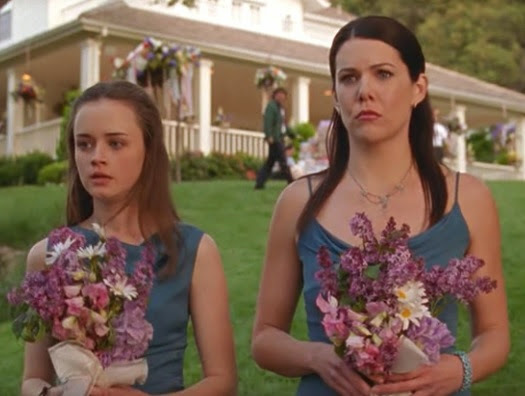 Series 2: Lorelai and Rory at Sookie and Jackson’s wedding. Both have been knocked askew, Rory from kissing Jess and Lorelai from Christopher’s news that Sherry is pregnant and his immediate departure. Rory: I think I’m going to Washington. Series 3: Rory’s graduated from Chilton and they’re about to leave the building for the last time. Lorelai: It’s not so scary any more. Rory: No. No, it’s not. Lorelai (to Luke): It’s never too late. Kirk: Help? Help somebody please? ← Alexis Bledel in Violet & Daisy at US theaters on Friday! I am pretty sure I would just die if there was a Gilmore Girls movie! I miss new watching new episodes so much…and I really want to see how their lives turned out. I need some better closure than the series allowed. Lorelai [to Rory] : So, the Father’s Jess? Miss Patty [to Kirk] : You’re no Taylor Dossie!! Emily [to Richard] : She’ll kill me yet!! Luke [to Lorelai] : A sister for April? Lorelai [to Emily] : I’m not your daughter? So it seems pretty clear that the movie is never going to happen (did anyone really believed it would past those few months right after the show ended?). As for those last four words……..no idea and to be honest, I’m more curious to know where the lead characters were supposed to end up (….or end up with). As for Amy Sherman-Palladino, when I think about the way season six ended, I still assume her last four words to the producers, the writting team and, ultimately, the fans of the show were “now deal with this”. No big deal and I wish her the best, but that how it felt (and feels) to me. Emily (to Jess): See you Friday night. LG: Yes! and then what did they do? I’ve been dreaming of the Gilmore Girls Movie on a weekly basis. Re-watch the entire series every year! It only become more and more amazing each time I watch it. I really hope there’s a movie coming out soon!!!!!! I’m hoping and dreaming and I’m going to continue dreaming and hoping for a Gilmore Girl movie! A Gilmore Girls movie would be ideal. My obsession with this show has yet to cease even a little. I really hope in the next couple years it becomes a reality!!! I think the last words would be from Lorelai to Luke saying she’s pregnant. Ahhh I just hate how things ended. ASP please rectify this situation!! Omg I would love a Gilmore girls movie! With luke and lorelai married with two kids. 3 and 2. Man I hope they make one. I was a woman with a career with 2 young girls when I got divorced. Right after my divorce, when my Mom sent mail to us it was always addressed to “The Becker Girls”. This was years ago–My Mom had died suddenly, and I never asked her about “The Becker Girls”. I always thought it was a way to keep us upbeat and happy. in 2015, I started watching Gilmore Girls and my daughters, now grown, said, “Grandma always watched this show when we were over and she really liked this show” I love the show, and when I watch each episode, I can’t help but think my mothers eyes viewed these episodes, and that she thought about me, as a single Mom raising my daughters similar to Gilmore Girls. It makes me happy but sad at the same time. I have since kept “The Becker Girls” as our signature for everthing from Christmas cards to Thank You notes. Thanks Mom. I love you Mom. Lots of folks in the ballpark on predicting the final four words! !